The Clinton surplus is often cited by liberals who wish to show that the “tax and spend” philosophy isn’t as fiscally reckless as it sounds. If we look at the government statistics there does appear to be a surplus during the last four years of Clinton’s presidency, though, as my friend Dan Bongino points out, the national debt rose every year under Clinton. So how did both these things happen? First, lets start with some history. To recap Clinton’s tax policies, in 1993 two new top income brackets of 36% and 39.6% were added, as was a raise in the corporate tax to 35%, an extension of the Medicare payroll tax to all levels of income, and a small increase in the gas tax. Overall, these taxes were expected to boost revenues by 0.36% of GDP during their first year, and an additional 0.83% by 1997. Clinton did manage to see an annualized 19.3% increase in tax revenues from 1993-1996, though it should be noted that Reagan actually managed an impressive 24.1% during his presidency. In 1997, the now Republican controlled congress reversed some of the Clinton tax increases by lowing the capital gains tax, creating a child tax credit, increasing estate tax exemption and income limits for deductible IRAs. In all, these cuts reduced the burden of taxation by about 0.22% of GDP (or in other words, the tax cuts reduced taxes by $30 billion – 26% of the 1993 increase). Economic performance under Clinton fared better from 1997-2000 compared to the 1993-1996 period in terms of job creation, wage increases, and GDP growth. 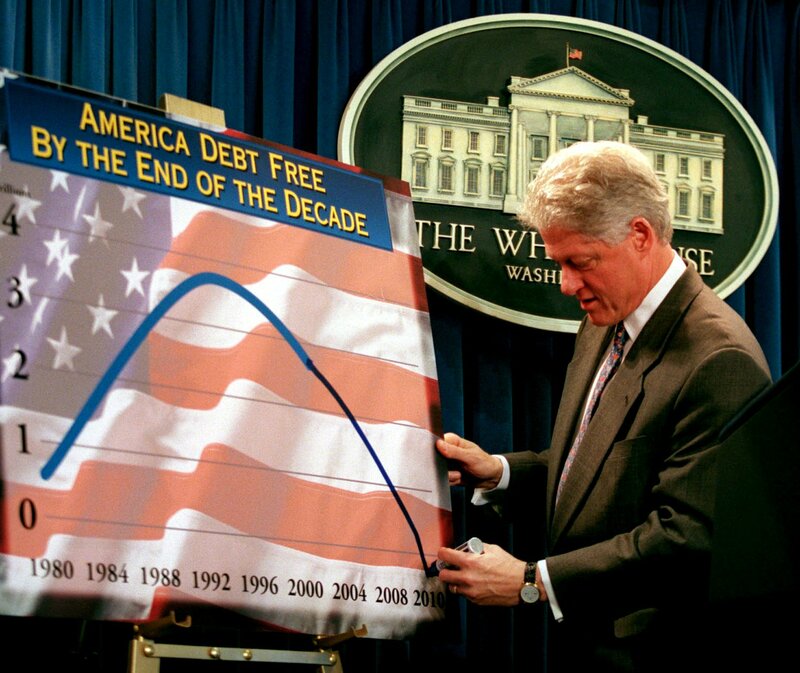 Two years following the Clinton tax hikes in 1993, in April of 1995 the CBO released deficit projections for the next few years of the Clinton presidency. Below they are tabled against the actual deficits. Table Source: Laffer, Arthur. “The End of Prosperity,” p. 129. Based off data from Congressional Budget Office forecast, April 1995. Note: “Surpluses” continued into 2000 and 2001 but weren’t included in that source. Keep in mind here, this was after the Clinton tax increases and before the Republican tax cuts, and yet the CBO still projected deficits in years to come. So what actually happened? So how is this possible? How did Clinton produce a surplus when he never collected enough tax revenues to fund government entirely, and why did the national debt increase in the face of an alleged surplus? That’s where a piggy bank other than the American taxpayer comes into play: the Social Security trust fund. Tabled below is the components of the national debt – public debt plus intragovernmental holdings. Public debt is the discrepancy between taxes and spending (accumulated deficits), and intragovernmental holdings is money borrowed from government trust funds, such as the Social Security and Medicare funds. An increase in intragovernmental holdings would signify that more money is owed to the Social Security/Medicare/etc. Note that every single year there was a claimed surplus, the money owed to intragovernmental holdings increased by a larger amount than the alleged surplus, meaning that borrowing from other areas of government filled both the gap between tax revenues and government spending and produced the “surplus.” This is essentially the governmental equivalent of paying off one credit card using another. This Clinton surplus cannot be used to discredit conservative fiscal policy, because the “surplus” itself was a phenomenon of creative accounting, not policy.